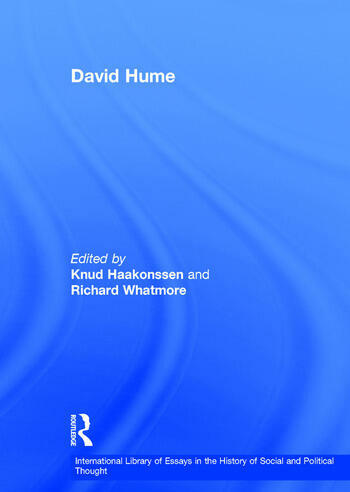 This volume on Hume's politics brings together essays that have been formative of the scholarly and more general debate about Hume's political thought. Unlike many theorists who express their thought in terms of system, Hume uses the incidental genre of the essay as the vehicle for his writing and his mode of presentation is a reflection, indeed an expression, of his belief in the limited power of reason to give any over-all shape to human life. Hume's politics are particularly suited for discussion of a wide range of view-points. The possibilities of seeing in Hume both the conservative and the liberal are pursued along with Hume's sophisticated analysis of party-politics. His acute and pioneering theorisation of perhaps the most central issue for 18th-century political observers, that of commerce and politics, is brought out in the context of his ideas of the international order. His fundamental theory of justice is discussed in its connection with law, property and government. Contents: Introduction; Hume's political science and the classical republican tradition, James Moore; Hume and the contexts of politics, Richard H. Dees; David Hume and the conservative tradition, Donald W. Livingston; The public interest vs. old rights, John B. Stewart; Hume and Madison on faction, Mark G. Spencer; Selfish and moral politics: David Hume on stability and cohesion in the modern state, Jeffrey Church; David Hume's political philosophy: a theory of commercial modernization, Carl Wennerlind; Hume, modern patriotism, and commercial society, A.B. Stilz; The European, or cosmopolitan, dimension in Hume's science of politics, Duncan Forbes; Laws not men: Hume's distinction between barbarous and civilized government, Neil McArthur; David Hume and the Common Law of England, Neil McArthur; Utility and humanity: the quest for the honestum in Cicero, Hutcheson and Hume, James Moore; Hume's 'original difference': race, national character and the human sciences, Aaron Garrett; Hume's theory of justice and property, James Moore; Hume's obligations, Knud Haakonssen; Hume's account of social artifice - its origins and originality, Annette Baier; Artificial virtues and the Sensible Knave, David Gauthier; Artificial virtues and the equally Sensible non-Knaves: a response to Gauthier, Annette C. Baier; Motive and obligation in Hume's ethics, Stephen Darwall; Hume's Knave and the interests of justice, Jason Baldwin; The first motive to justice: Hume's circle argument squared, Don Garrett; The shackles of virtue: Hume on allegiance to government, Rachel Cohon; Hume's critique of the contract theory, Stephen Buckle and Dario Castiglione; Name index. Knud Haakonssen is Emeritus Professor of Intellectual History at the University of Sussex and University College London, UK. Richard Whatmore is Professor of Intellectual History and the History of Political Thought, and Director of the Sussex Centre for Intellectual History, University of Sussex, UK.